At the request of citizens, the city of Missoula is studying potential ordinances or voluntary programs that would ban or limit single-use plastic bags at local retail stores. There’s ample precedent nationally: 349 U.S. cities, counties and states already ban or tax the use of plastic bags. And while city staff and some elected officials have been interested in addressing the use of plastic bags for years, the recent escape of trash – much of it single-use plastic – from the Missoula landfill prompted a citizen outcry. Even as Republic Services worked to corral the bags blowing across Interstate 90 during a March blizzard, residents asked City Council members, the mayor and city staff to ban plastic shopping bags. In fact, Republic Services general manager Glenda Bradshaw told Missoula Current that she’d welcome a conversation about banning the briefly used but long-lived plastics. One recent study estimated that a single-use shopping bag has a 12-minute lifespan from the moment it’s filled with groceries or other goods to the moment it’s discarded by a shopper. It will take that same bag anywhere from 10 to 1,000 years to decompose, depending on environmental conditions at the landfill where it ends up. Now Chase Jones, the city of Missoula’s energy conservation coordinator, is researching ordinances and voluntary programs enacted by other cities across the U.S.
“I don’t know if we’ll end up at an ordinance or with something voluntary where we enlist small and larger retailers, or some combination of those approaches,” said Ginny Merriam, communications director for the city. Already, the research has dispelled one prevalent local urban legend – that cities in Montana are prohibited from adopting a ban on plastic bags. Dozens of U.S. cities charge shoppers 10 cents or a quarter to use a plastic bag to carry home their purchases from a retail store. Others charge a deposit if a shopper uses a plastic bag. But Missoula could simply ban single-use plastic bags at retail outlets, forcing shoppers to bring their own bags to the store or, possibly, to use a paper bag or cloth bag or cardboard box provided by the retailer. Hundreds of U.S. cities and counties have outright bans on single-use bags, as do the states of New York, California and Hawaii. And at least two Missoula stores voluntarily forgo the use of plastic bags. Costco reuses boxes to hold shoppers’ purchases and offers no bags, plastic or paper. The Good Food Store has no plastic bags; shoppers either bring their own bag or pay the store for a paper bag. Retailers in some U.S. cities have used plastic bag bans as an opportunity to distribute or sell cloth bags to shoppers that carry the store’s logo, a bit of advertisement in the name of environmental protection. Yet another approach would be to enlist the community in bringing about a change in the “social norm,” Merriam said. As the social norm changed, shoppers would voluntarily and routinely forgo the use of plastic bags in favor of bags or boxes they brought to the store. No longer would shoppers expect that purchases be placed in plastic bags – or double bags, as at some Missoula grocery stores. The city could also team up with local nonprofit groups to work with individual stores and encourage the voluntary discontinuation of single-use plastic bags. “We’ve heard people say they want a ban, or at least a conversation, about single-use plastics,” Merriam said this week. 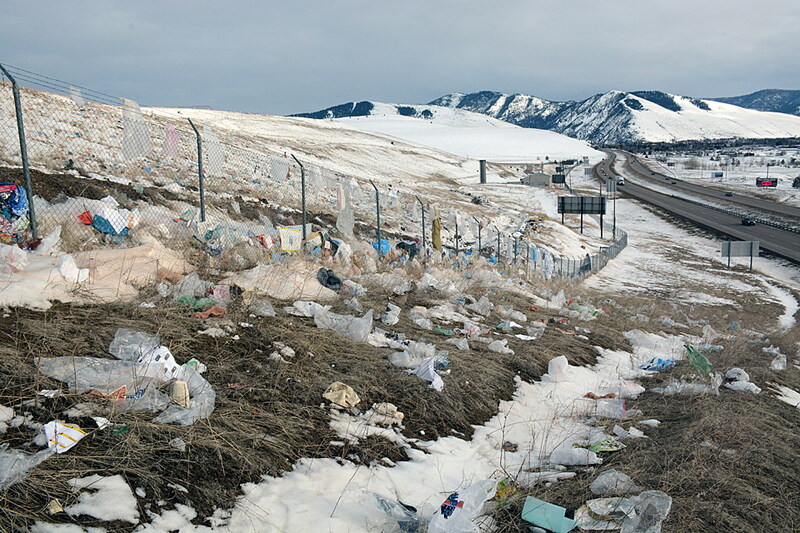 At Environment Montana, director Skye Borden said all Missoula residents – not the landfill – were to blame for this winter’s blizzard of plastic bags on the hillsides and in the median along I-90. Borden found ample support on social media and at the March 11 City Council meeting.